Why should you back up your device? If you already store most of your data in cloud-based storage services, why is it so important to do a hard backup of your devices? Oftentimes, when I write something about backing up your computer, I notice comments from people that say they keep everything in iCloud, Dropbox, or some other cloud-based storage system, so they don't feel the need to back up their computer or iOS device any other way. It's true that cloud-based storage services are great for keeping your most important documents safe, but that's not all there is to backing up your data. Speaking from experience, restoring everything on your computer or phone is a real pain if the only place you keep stuff is in the cloud. Due to the nature of my job, I regularly restore my Mac or iPhone as new so I can write up detailed how-to guides for restoring from backups, starting fresh, doing clean installs of operating systems, and so on. I hate doing it, but I do it because I love you and want to make sure you know the proper steps. So, believe me when I say that I know how time consuming and frustrating it is to start over from scratch with an iPhone, iPad, or Mac. It's more than just the photos, documents, and other data you can easily retrieve from cloud-based storage services. 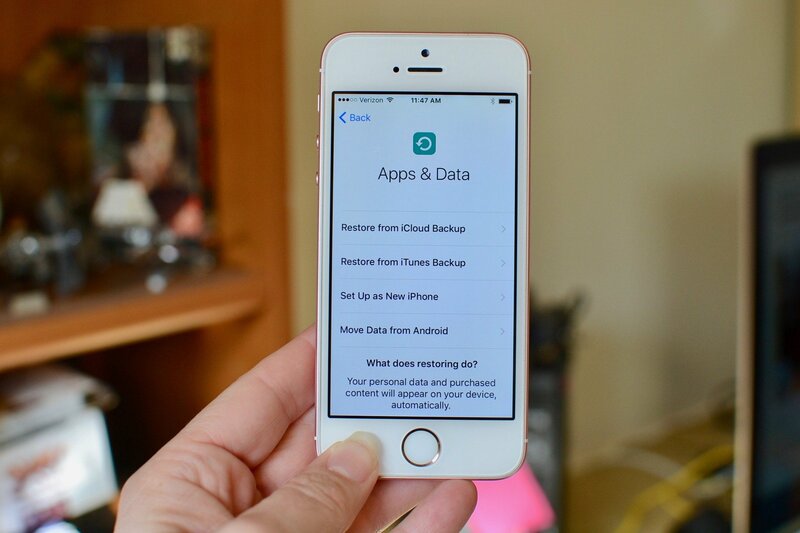 One of the biggest problems with starting new on a device is not that you've lost your data (if you are storing it in a cloud service), it's that you've lost all of your apps. Sure, you can re-download all of those .doc files from Dropbox, but you won't be able to open them until you've reinstalled a word processing program. Your pictures may be safe in OneDrive, but if you want to edit them, you'll have to track down that photo editing app you love and download it again. If you're also trying to download a bunch of documents back onto your Mac, your internet is going to really feel the strain when you also start trying to download the dozen apps you use on a regular basis. Starting over takes time and really messes with your productivity. Here's a simple scenario that I've experienced and will probably make you cringe a little. After starting fresh on macOS, I needed to install a couple of apps I use all of the time. I also needed to sign back into those accounts where my data was so nicely being securely saved in a cloud-based services. I didn't yet have 1Password installed, so even after I downloaded the apps, I still had to get my password manager up and running before I could even start working. Another huge problem with having to start from a new setup is that you lose all of your settings. On the iPhone, this means reregistering your fingerprint for Touch ID, which if you use more than one finger is time consuming. It also means you have to reinstall and set up any customized ring tones and assign them to your contacts if you do so on an individual basis. You have to enable iCloud Photo Library if you use it, so you can get those photos back on your iPhone. Things are just as screwy on the Mac. Your mouse and trackpad settings all reset, so scrolling will throw you off until you get it back to your liking. All of the notifications you prefer to have on or off are lost until you enable or disable them again. Any particular sound settings are gone. All of these little setting adjustments you've made over the weeks, months, or years are all gone. It messes with your productivity because nothing feels right and you just want to throw your device out of the window for not acting the way it is supposed to. It can be incredibly frustrating to have to start over on a Mac or iPhone and re-download content from those cloud services you love so much. If you want to show your brother that cute photo of his nephew, you might as well invite him to stay for dinner because it's going to be a long time before everything is back on your phone again. Getting all of your music back onto your Mac from iTunes is like watching The Cure playing in slow motion (in other words, it takes forever and is really boring while you wait). If you're downloading apps, documents, movies, music, photos, and trying to get your settings in order again, you can be sure everything will run super slow for a while and chances are your battery life will suffer a little. Because, even if you store all of your app purchases, music, and photos in iCloud and all of your spreadsheets, reports, and fan fiction in dropbox, starting from scratch on your device, whether it's a computer or a mobile device, is time-consuming, frustrating, and destroys your productivity for a period of time. Would you rather spend hours downloading files, reinstalling apps, and readjusting your settings or just tap "yes" when asked if you want to download from a backup and wait a few minutes for everything to go back to normal? If you need help backing up your device, check out our handy guides. Do you have a healthy backup plan for all of your devices? What is your preferred method?